Picking a sales CRM system can be tricky. Should you go with a market leader? How can you tell which one meets all of your needs? Which one will really help you boost sales? 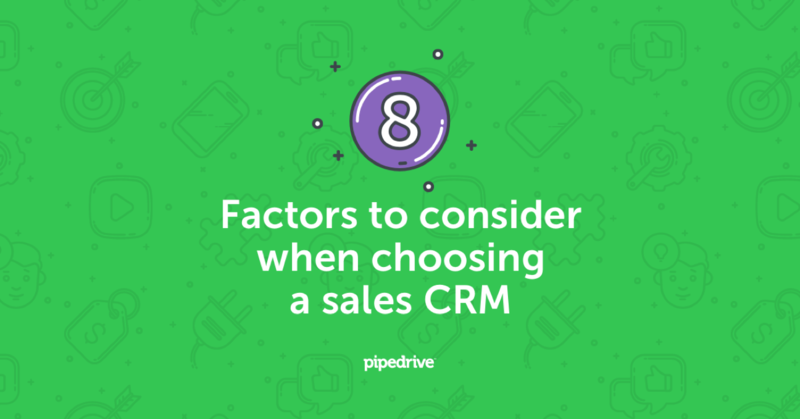 If you want a successful CRM implementation, these are the kinds of difficult questions you’ll have to explore. To start you off in the right direction, here’s a no-nonsense guide to choosing a sales CRM. For most CRMs today, you’ll pay a fee per user each month. So the first thing to do is get that figure, multiply it by the number of expected users and compare the result to your budget. In a recent CRM Industry User Research Report, Capterra found that 61% of businesses spend more than $50 per month per user. Mind you, that research included old-school, establishment CRMs. This is important because many of today’s most innovative CRMs have been around only for a few years, are aimed at small and medium business, and aren’t nearly as expensive as those built for large enterprises. While costs often are easily located on a vendor’s website, determining what’s included in those costs can be a chore. You have to scrutinize the fine print. At the outset, know that vendors offer vastly different plans. So before you commit to one, have a clear understanding of what levels of support, analytics and other features come with the plan you’ve chosen and which cost extra. It’s crucial to determine the problems you’d like the CRM to solve. Is it tracking leads? Is it sales forecasting? Is it increasing profitability and productivity? When devising your goals, don’t just ping members of your sales team. Instead, consider involving other departments such as marketing, finance and operations. For instance, you could ask each department to jot down which goals are “nice to have” and which are mandatory. Even if executive buy-in is strong, each time new software is introduced into an organization there’s a possibility that some salespeople will be frustrated about learning yet another application. Ian Altman, who once founded a company that implemented CRM software, wrote an article for Forbes about choosing the best CRM for your sales organization. In it, he recommends that you pick a CRM that your organization will actually use. Altman acknowledges that this advice sounds corny. However, he explains that CRMs are useless if your employees won’t use them or if they require salespeople to spend an inordinate amount of time entering data rather than executing deals. There’s no simple, sweeping solution that’ll guarantee your staff will wholeheartedly embrace your chosen CRM. If you involve your team in the CRM selection, show the value and lead by example, you’ll increase your chances of CRM adoption. You not only have to find one that is logical, intuitive and easy to use, you also have to invest in training your people to get the most out of it. So when picking a CRM, get a feel for how much training your users will need. Is should be so simple that users will need little training. For administrators and power users, it’ll be a different story. For them, the CRM better have excellent tutorials, videos and more. Some large-scale market-leading CRMs try to be everything to everyone. Think of any feature and they’ve possibly got it. But the titans of the CRM industry, with all of their built in bells and whistles, are being broadsided by CRMs that focus more on playing nice with existing services. In a word: integrations. With add-ons and plug-ins, an organization can attain a high degree of automation with relative ease. From adding contacts to creating invoices to scheduling reminders, integrations extend your chosen CRM’s “out-of-the-box” functionality. With that in mind, when evaluating CRM solutions, pay particular attention to how the vendor integrates with email, business proposal software and customer analytics apps. Add custom fields and lists. Turn features on and off. Set up individual and team dashboards. Mind you, if the vendor can’t quickly show you how to achieve simple customizations, consider it a red flag. Alternatively, if the vendor regularly talks about higher-end custom options that you have to pay for, consider that a warning, too. It’s a given that your salespeople will want to take their CRM with them on their preferred devices. That’s why many CRMs come with iOS, Android or Windows mobile apps. But don’t stop at checking if a CRM can run on smartphones and tablets. Go one step further by visiting iTunes, Google Play and the Windows Phone Store. At those app stores, view customer reviews and gauge what users honestly think. Before you make your final decision, demo some of the most important features. Play around with an interactive online demo or arrange for a product expert to give you a guided tour. Unfortunately, on the company websites of many CRMs, videos labeled “demo” are often filled with flashy graphics, uplifting music and vague promises — they’re essentially just advertisements. If you can’t find genuine demos to help with your decision making, keep in mind that many CRMs offer free accounts for a limited number of users. Their hope is that you’ll upgrade to a full plan. Your objective should be to try to experience firsthand some of the strengths — or weaknesses — of the CRM before taking the plunge. CRMs can provide insight into social media monitoring, measuring your organization’s performance, and — perhaps, most importantly — boosting your sales. Picking the right solution for your organization, however, involves juggling competing goals from different organizational departments, weighing costs and committing to an IT solution that’ll probably be around at least a few years. Implementing a CRM involves a few more hurdles that you’ll have to jump over, such as customizing and integrating it. But once it’s up and running, and you’ve automated as many tasks as you can and tweaked it just right, your salespeople will appreciate it — because most of them probably just want a simple, strong solution that supports them doing what they’re great at: selling.